West of Fiji and southeast of the Solomon Islands is a small island nation known as Vanuatu. Time moves a little slower in Vanuatu, not that anyone there actually minds, in fact this is a big part of the appeal of the place. Emerging ever so slowly on the island is a half-realized luxury resort on a spectacular tract of land where the forest meets the sea. "We see the bones, the inner working, the structure – the important business of architecture before the detailing of surfaces and slick styling. This is architecture at its rawest." 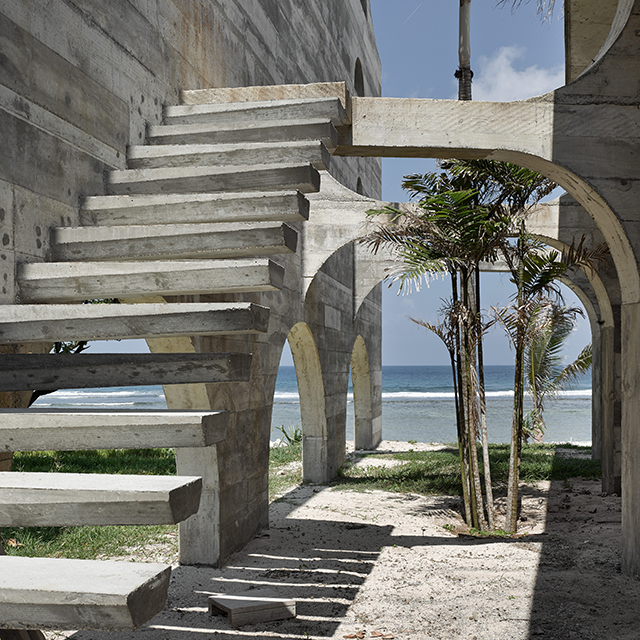 Remarked photographer Peter Bennetts, in regards to the beauty behind Architect Kristin Green's soon-to-be new hotel, La Plage D’hotel Du Pacifique. The first of 18 villas are nearing completion with a strategic design that allows wind to pass through with little to no need for air-conditioning. Here, modern forms take on an ancient roman bath providing escape from the demands of the city. Areas of the resort are separated by dancing concrete limbs intertwined casting shadows to relieve one from the tropical sun. While building the fortress, Green explored a cinematic experience, coupled with the ideas of leisure, romance and dreaming. With these experiences in mind, the architect created an open air roof garden for dining, cocktails and sun bathing, along with a casual poolside grill bar and a formal restaurant. In addition to the restaurants, the establishment features 18 undulating villas, a spa, swimming pools, and outdoor facilities including; Pétanque, beach tennis, swimming, handball & board games. All components of the villas are custom made; complete in-situ concrete board marked walls, floor & roof, concrete benches, day beds, cast-in-place basins and handmade light fittings, inbuilt furniture, sunken baths along with timber herringbone windows which are hand carved from local timbers by local craftsman and hand cut stone floors. Green is regularly on site coordinating fabrication techniques and ensuring consistency of local construction methods. Each villa is conceived as a robust, cyclone ready building, the result of a series of key relationship studies between man, building & the tropical landscape. The nature of the body disrobing, exposure, privacy & the personalized experience offers a certain romance and seclusion for its patrons. The resort's spa offers a place for the leisure, relaxation and sensual decadence that one would expect from a quality 5-star experience in the Pacifique. A concrete slide, colonnade and capital recall the Ancient Roman baths, a direct homage to Emperor Hadrian (the pool is literally measured from & at Hadrian’s villa in Tivoli, outside Rome); ‘only here can one truly dream of being lost in time’. Irregular clusters of Pandanus & palm trees, a simple landscape of grass and white sand ground surface make bare feet in Vanuatu is an absolute must. The tree roots emerge from the ground like something of a child’s dream, creating gentle barriers and shadows. The architecture of La Plage D’hotel Du Pacifique is designed to protect from violent storms, and offer patrons are a chance at romance, to dance, dream and escape; rekindling love, offering hope for the future & their well being.